The automated train prototype can travel for about 100km (60 miles) without driver intervention. Automation will free the train driver to focus on supervising the train’s progress. The test’s purpose is to provide a live demonstration that the train and the signal system can communicate effectively to drive the train. Alstom signed an agreement with the the Dutch infrastructure operator ProRail and Rotterdam Rail Feeding (RRF) to carry out the tests along the Betuweroute – a 150km double track freight railway line connecting Rotterdam to Germany. Although automation is considered to be the future of transport, it is unlikely that driverless trains will ever be completely autonomous. “I can’t ever see it where there is no-one sitting at the front of the train at all,” rail journalist Tony Miles told the BBC. “We prefer to have someone there to press an override button – for example, if rogue vehicles crash on to the train tracks, or people jump in front of trains. “The driver gets a feeling and can tell long before a computer can. 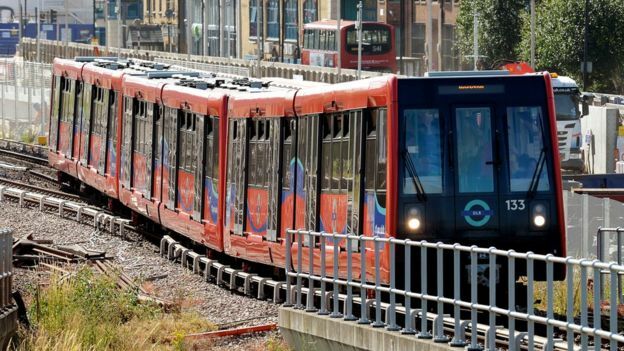 Driverless train technology already exists – the Docklands Light Railway (DLR) is fully automated – but Mr Miles predicts that it will still take between 30-50 years for the technology to be realised in Europe, because getting an automatic signalling system to work over a long distance is difficult to achieve. There is also the issue that while it might be easy to design an automated railway line from scratch, upgrading existing lines is more complicated. “When you try to redesign the big Victorian railways built 150 years ago, it’s a lot harder as they were never designed to be automated,” Mr Miles said.